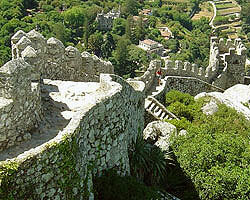 Perched on one of the seven hills comprising Lisbon, Castelo has some of the city's most spectacular views. Situated around the emblematic Castelo Sao Jorge, the district has small squares, bars, and shops are tucked quietly into its narrow streets. It is a cosy neighbourhood, with many small groceries run by friendly old locals, although the nearby Praca da Figueira is another busy shopping area full of traditional Portuguese shops and more modern brand-name stores. Castelo offers similar investment property opportunities as those in Bairro Alto. Parking in Castelo is notoriously difficult, although developers are now creating underground parking spaces under the old structures.